The domain of the Comanches from early 1700's to Mid 1800's. Reached from the foot hills of the Rockies to New Mexico. Eastward to the cross timbers of Texas and Oklahoma and from the Arkansas River to Kansas, south to the Texas Pecos River, Rio Grande area. The Nation was 600 miles from north and south, 400 miles from East to West. Among the 1st Plains Indians to acquire horses from Spanish settlers. Comanches soon became legendary horsemen. Seizing control of Comancheria and securing their Land of Waving Grass and Buffaloes from intruders. These ancient Wichita Mountains you are now viewing were center in the heart of Comancheria and scared to the Comanches. The aged Ceders used in ceremonial for centuries still stand guard. 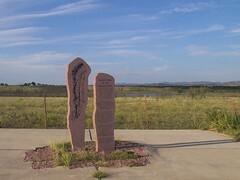 Dedicated to the preservation of the NUMUNUU (The Comanche Nation this Quanah Parker seneic turnout was erected in 1997 by the Dept of Transportion and the Jackson County Historical Society. Quanah Parker the last of the Comanche chief was born in Elk Creek just below the Washita mountains circa 1850. Quanah, the son of Pitih Norony and Cynitha Ann Parker who was captured by the Comanches, became a fierce warrior and skillfully defended Comancheria against all invades. Col. Ronald McKenzie pursued Quanah for years but never captured or defeated him. The destruction of the buffalo forced Quanah to lead the Comanche down this trail to Fort Sill in June 1878. A born leader Quanah bridged the great gap between the old world as a War Chief to the new life as a Civil Chief without losing his Comanche identity. A prominent and influential figure he made numerous politic and economic issues. (Quanah) In 1889 he built Star House a ten room two story house ten mile NE of this sight for his wifes, children and anyone who was seeking help. Quanah was buried in 1911 at Post Oak Mission seven miles NE and reburied 1957 in Fort Sill. The spirit of Quanah Parker the Eagle of the Comanches welcomes you to his scared home the Washita Mountains.